You’ve no doubt heard the saying you are what you eat. Did you also know that we are what we think? What we think about can either hinder or help us succeed. There is a deep connection between our beliefs and behaviours. What we think can help us learn new skills and habits. And they can help us grow and change for the better. Unfortunately the opposite is also true. Our thoughts can keep us stuck when we believe things can’t change. I’ve know this simple scripture for many years. Proverbs 23:7 “As a man thinks in his heart so is he.” It’s simple to say. It only takes a few seconds to read but to do, well that’s another story. For me, it’s a story with plenty of ups and downs, but one overflowing with gratitude when I think about the power we have to change our life. Thankfully anyone can do it and it only takes small concision action. As I began to write about making our mind our friend, it turned out to be a bigger than I first planned. So today’s article is part one. I love it when science digs into a topic like this one and starts to explain what we know to be true but don’t have the words to express it. One researcher I want to point out today is Carol Dweck. She’s a professor at Standford University who is well known for her work on “fixed verses a growth mindset”. Her work explains that If we have a fixed mindset we think that our intelligence, talents and abilities are fixed. That they can’t or won’t change. And when we think things are fixed we end up trying to look smart and cover up what we don’t know. Not terribly helpful if we want to achieve our goals and improve our life. On the other hand if we have a growth mindset we understand that our talents and abilities can develop through effort, good teaching and persistence. We believe that we can get better if they work at it. The common element in these two very different views is what we believe. And our belief strongly influences the choices we make, which leads to being successful or not. Your brain is one of the most amazing muscles you have. Feeding it the right stuff such as positive beliefs and new information is like doing exercises or a gym workout for your body. Negative, doubtful thoughts and wishful thinking keeps your mind from getting in shape. These kinds of thoughts have the same kind of effect as a diet of junk food has on your body. Feeling sluggish anyone? lack focus … someone say squirrel! All those effects lead to being stuck. I imagine you’re like me and have experienced these at different times in your life. In the past when things went wrong, challenges came or set backs happened, my thoughts kept me stuck. I looked for ‘reasons’ (read that as excuses) why this was happening to me. That’s the unfortunate result of a fixed mindset. You look to the external for excuses because you are covering up your lack of ability, rather than the internal for solutions, ways you can change and make things better. So how do you develop a growth mindset that will help you succeed? 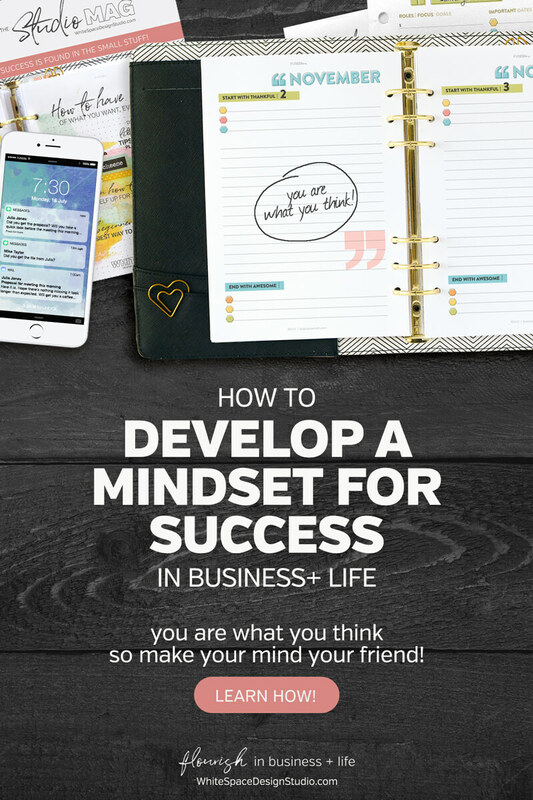 There are a two things you can do to help develop a mindset for success. These simple actions have had a huge impact in my life, so I’m glad to be sharing them with you today. First is to create an environment for success. And the second is to take consistent daily action. We’re going to look at the second point in this article today, the power of consistent daily action. The small actions you do on a consistent daily basis play a large part in the life you are living today. Yes, there are things outside of our control, absolutely. But there are also some things we can control and we’re going to be focusing on them here. The same is true for other things we build in our lives too. Think about the different results you would have if you chose to eat a chocolate bar each afternoon or you went for a short 15 minute walk. One might feel good in the moment but the other would inspire new ideas, recharge your mind and be good for your waistline. In that example it’s easy to see how small daily actions can have a huge impact on the outcomes in your life. Doing what we need to do is important. Sometimes that is easier said than done. But it does make up a large part of your success. But it’s not the only part. The growth mindset is about believing that things can change. It’s believing that you can get better and smarter overtime. There are two parts to the action you take each day. While taking action is essential for success, it’s the second part, the execution, that can really make a big difference to your outcome. How you do what you do is more important than trying to get the right result. Read that last sentence again, and let it sink in. When you focus on being perfect, doing that thing right, you increase your chance of failing. That’s because you’re measuring the wrong thing. What do you do when you don’t get something right? Most often you want to quit. That’s the result of a fixed mindset. You’re trying to look smart and be perfect. An impossible expectation, especially when learning something new. Now think about the opposite. With a growth mindset your focus is on how you are doing something and your attention shifts from getting it right to getting better. Instead you focus on improving, not quitting. Remember a person with a growth mindset believes they can develop their abilities, talent and intelligence with effort, good teaching and persistence. They know that what they’re doing is worth doing poorly while they get better at it. Ask yourself, what are you currently trying to get right? Now write down one way you can improve how you’re doing it. Then focus on doing that activity better and see what happens. #tip : Journal about what you’re doing each day and you’ll record your own unique system for success. When you focus on how you execute you are not just being productive and getting something done. You are also becoming efficient by improving over time. And becoming efficient saves you time! It makes doing things easier and less overwhelming. Small consistent action with a focus on execution is the key. It’s the secret to achieving your goals and being successful in business and life. This is the growth mindset in action. #tip : To learn more about the incredible power we all have to take small consistent daily action and the results it can bring, I’d recommend reading a great book called The Slight Edge by Jeff Olson. It changed the way I saw the small things I do on a regular basis. And it’s empowered me to maintain habits and let go of the yoyo commitments I made with myself. Now you know how to use small consistent daily action for success, share an insight you learnt today in the comments below. Next week we’ll take a look at creating an environment to succeed. It’s spring cleaning that takes care of itself. Think about your goals, what you’d love to succeed at. Are you trying to do it perfectly or are you celebrating getting better at it each day? Pick one thing and write down one way you can improve how you’re doing it. Now track your progress, write down what you’re telling yourself when things aren’t going right and how you are cheering yourself on.